While Windows Phone is barely relevant in today's smartphone market, Microsoft has found another way to reach mobile users around the world: via apps. The Redmond company already launched many apps of its own on Android and iOS, and it's now adding another (quite important) application to its portfolio: SwiftKey. In case you don't know, SwiftKey is a software keyboard for Android and iOS, and it's extremely popular: at the moment, it's installed on about 300 million devices (Android and iOS combined). According to The Financial Times, Microsoft is paying $250 million for the company behind SwiftKey. Reportedly, the deal will be officially announced later this week. Microsoft already has a software keyboard (Word Flow), which is available on Windows Phone devices, and will soon be released on iOS and Android. Needless to say, the acquisition of SwiftKey will help Microsoft improve its keyboard game (if we may put it this way). However, Microsoft is likely purchasing SwiftKey for its artificial intelligence technology, rather than the keyboard app. SwiftKey relies on artificial intelligence to learn how users type on their mobile devices, thus being able to predict future words. SwiftKey Keyboard was a paid app until 2014, when it became free (but introduced in-app purchases, allowing users to buy themes and other personalized content). SwiftKey also developed an Android launcher, though this one has failed to gain popularity, and isn't as appreciated as the keyboard. I prefer the original Swiftkey too, but the Samsung stock keyboard (at least on recent high end phones) is based on Swiftkey's core code and SDK, as confirmed by Swiftkey recently. Which also explains why the swiping and self learning effects are similar.https://blog.swiftkey.com/samsung-keyboard-security-vulnerability-swiftkey/ This also means that the installed base for the Swiftkey core code is probably even well past 300 million, since Samsung sells more than that in a year alone. Samsung stock keyboard is SwiftKey. It doesn't come preinstalled in my S6. He meant the Samsung Keyboard. The stock Samsung keyboard which comes installed is swiftkey. I mean it shares the same AI and prediction algorithms. The outer appearance is different in Samsung one and you get a few extra features like change in keyboard theme according to the Touchwiz theme, adjustable height etc; but the internal working is same. Since when? Haven't knew that til now. A few years I guess. It certainly wasn't on the S3, that we the phone I installed my first 3rd party keyboard on because I couldn't take it. Ironically, that replacement keyboard was Swiftkey. I am certain it was on S4. The word flow keyboard is already way better. What's the point in buying this? don't you worry. Cortana will spy on you. The AI in word flow is not nearly on the level of the SwiftKey learning algorithms. 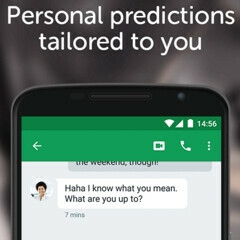 SwiftKey not only is better at predicting your next word based on context, but also based on what it learns about you. Of course SwiftKey users who've been happy with that app watching them type for years will claim that MS is 'spying on me', as they like to do with MS products. I use SwiftKey keyboard. The themes are awesome as well. They've since released Windows Updates that bring these awesome spying "features" to 7 and 8 as well, so you're not missing out! i tried this keyboard and didn't care for it and went back to Samsung one. but 250 million seems a little too much? I don't care what or not MS buys, all I ask is that they don't mess up SwiftKey for me.